We bought our first pieces of furniture this weekend for the new house. Since our current family room furniture will be in the basement at the new house, we needed new furniture. We've been looking online and have been to a few stores. We really wanted something durable and comfortable. With three kids, two big dogs and two cats, we wanted something that would last. We ended up going with couches from La-Z-Boy. Now, this is your traditional La-Z-Boy furniture. It's a bit more modern looking. We wanted clean lines and that's exactly what we found in the La-Z-Boy Metro Sofa and Apartment Sofa (basically a loveseat.) They have a ten year warranty that covers stains, punctures, rips, etc. that was a must-have. It was so comfortable and everyone in the family was in agreement. How often does that happen? As CMM posted, La-Z-Boy has an in-house design consultant that will come to your home for FREE. They will also look at your floor plan if you're like us and don't have a finished house. There is also an accent chair that we may get after we're in and have a better feel for the space. Looks nice! Is that color you picked and the same accent pillows? 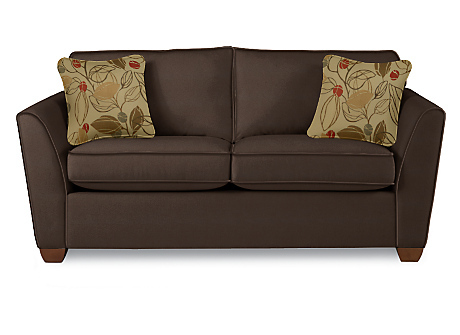 That is the color (Coffee) that we picked and the accent pillows that come with it. We didn't feel like paying the $49.99 to pick from the hundreds of other fabrics they had available. Just looking at them made my head spin. We had been planning for a chocolate brown color for that room anyways, so it worked out perfectly. I'm not crazy about the accent pillows, but if I don't end up liking them, I'll just recover them with something I like better. Seems like La-Z-Boy is the way to go from the posts. We will likely stick with the couches we have for now, but good to know about La-Z-Boy. I wish we didn't need new furniture. 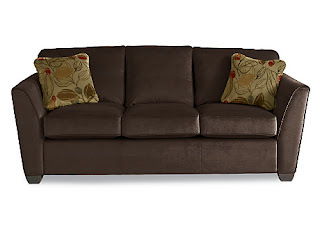 Our current couches are going in our finished basement so we have to buy something for the great room. great! do your feel touch the floor? How did you get the picture of your couch with the accent pillows online? I was on La-Z-Boy's website and I figured out how to get the couch I chose with the fabric I chose but I can't figure out how to change the accent pillows!? I don't have secret magical powers:) It's just that those pillows are the default fabric with our couch fabric. We did one of the standard fabrics and not one from the design center.